Wondering which of our magazines will fit your gun? Click here to view our magazine compatibility document. We have 2 basic sizes of 1911 magazines- Full Size and Compact. Full size is the traditional USGI 1911 frame size. Most 1911 pistols are "full size". This includes all of our Full Size models listed here http://wilsoncombat.com/new/custom-gun-models.asp in addition to most standard, 5" and Commander length 1911 pistols. Full size grips have a measurement of 3.0625" of center-to-center between the grip screws. Compact denotes a smaller frame similar in size to Wilson Compact, Colt Officers ACP or Kimber Compact / Ultra Series. 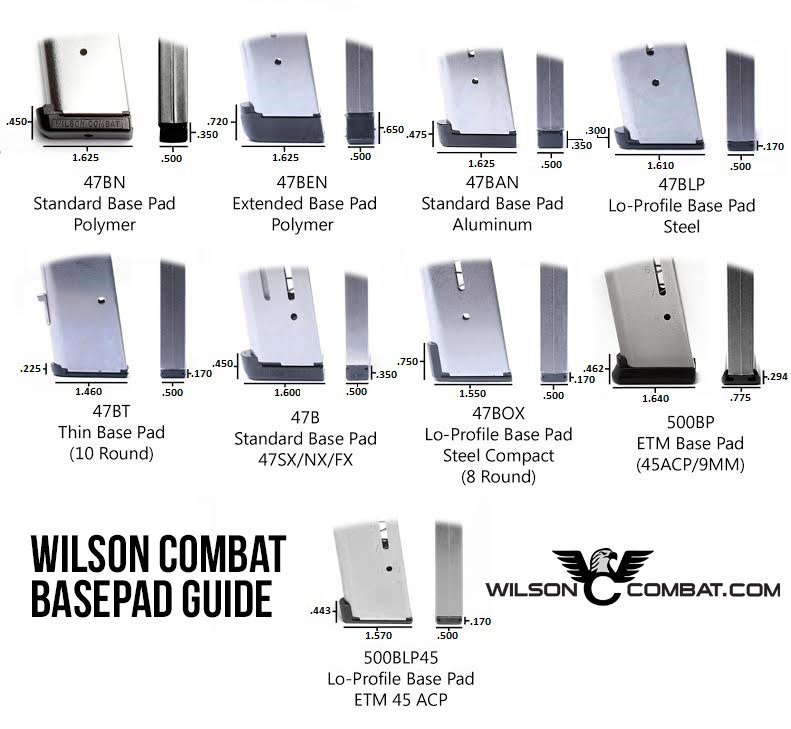 This includes all of our Compact models listed here http://wilsoncombat.com/new/custom-gun-models.asp in addition to most standard Officer's length 1911 pistols. Compact grips have a measurement of 2.6875" center to center. Bought 5 for Sprnfld Operator 9mm. After 1000 rounds through the system, not a single issue. There is a break-in period - after 200 + rounds through each mag, they are easier to manipulate, especially the 10th round.Great product WC. Ill be buying a few more for staging on vest, etc.. I have been using the old Springfield style 9mm mags in my Custom Springfield Range officer. While they feed great and never jam from cycling, they would regularly not lock the slide back and the follower would wedge against the slide stop. This is a custom, rebarreled, accurized $2000 pistol that wouldnt lock back. I tried three other 10 round mags but they either nose dived the bullets into the ramp, or the full magazine would not close with the slide in battery. I tried at least 4 other 9 round mags, none of which cycled well or locked the slide back or fell free or a combination of these issues. I was ready to sell this gun for pennies as the frustration of having to pry the magazine out or reach in to push the follower out of the way was pretty much insulting. I paid $2000 for this? I could not find ANY magazine that would combine, working with locking the slide back..... Then I just happened to read the story about the new 9mm ETM from Wilson and ordered one..........truly as a last ditch effort. This magazine saved this pistol. Now, it worked first time and every time. Plus, in my Caspian frame and Slide pistol that I built myself, it works equally wonderful. I cannot emphasize strong enough how joyful I am to find this magazine and keep the Springfield. Your new magazine is a fabulous piece of engineering, honest and earnest evaluation and a glowing example of how you listen to your customers and pay attention to your market. These are the best 9mm 1911 magazines I have ever tried. Thank you for caring about your customers and the 1911 shooters around the world. So, I bought a variety of mags to test in my new Dan Wesson Specialist. Every mag, including the factory CMI mags fed and functioned flawlessly, but one issue kept popping up. Whenever Id mash the mag release button with authority as one would during combat or competition reloads, the mag release would over-travel and pinch the mag, not allowing it to fall free. The only magazine that does not present this issue is the Wilson ETM mag. While all the others I tested worked well, needing to manually strip a mag from a fighting gun is unacceptable. My McCormicks, Dawnsons, and CMIs are all going up for sale, and Wilson Combat will be the only mag I use so long as I run 9mm 1911s. Thanks for a perfectly engineered product, guys! Ok, Ill admit, I never even gave the 9 rounders that came with my Springfield Armory Range Officer Operator 9mm a chance. Sold them as new on eBay and bought four of these. Get an extra round and feeding perfection. Shot 100 rounds through each magazine to test, and...10 rounds of perfection!! Get 5. Its nice to load a full box of ammo if you think about it. I used Cobra mags exclusively for all my 9mm 1911s till now. These improved WC mags are just as reliable and better built IMO, not a malfunction yet. I was sent a sample of the new 9mm magazine to test. The magazine body is very sturdy and as mentioned by others has a dimple and is easy to load. Though the last round was a bit harder at first. I let the magazine sit loaded for a couple days. Off to the range with Blazer RN, ASYM JHP, Wilson RN and Wilson FN the 135 gr just out. I only had one of the new magazines, four of the older which I did not used. I ran it through a CQB, and an Ed Brown Special Forces. Loading was a bit slow, again I only had one new style. First round using Blazer RN didnt feed. A bump on the slide and it went in. No issues after that with six full magazines of each brand ammo in the Wilson. Switched to the Ed Brown and ran another six magazines of each. Not a single issue. The first round mishap seemed to be an anomaly. 480 rounds total through two different maker pistols and only the first round issue. These magazines are winners. I like the numbering and follower. I felt it loaded easier then the older style. I did it by hand, no feeder. I havent taken it apart yet. Going to do another 480 next weekend. Thanks to Wilson for the trial magazine. It appears I will be purchasing a few more for the range bag. Only 180 rounds in, but havent had a nose-dive yet. Even with short 124 grain JHPs. Shot 147 flat-points too. And, of course, round nose. I am weary of any improved versions of things that already work well. It seems that improvements usually benefit the manufacturers bottom lines more than the products they say are improved. Not so in this case! Wilsons new 9mm Elite Tactical Magazine is yet another example of Wilson Combats outstanding products and customer service. I tested my first new ETM using an X-Tac 5 and an STI Duty One 4. 150 rounds each of 124grRN, 124grJHP, and 115grRN. Not a hiccup from either pistol. a perfect example of the best getting better. I shot this magazine in my 9mm CQB and it ran perfectly. I never really had problems with the old design so I did not know what to expect. The new mag has great build quality and I really like the metal follower. The rounds definitely seem to present easier/higher to the feed ramp. Just shot 150 flawless rounds. Very impressed. Highly recommend. Next Gen ETM 9mm Magazines are Great! I noticed when I opened these magazines they were different. Tube was similar to my 9mm Etms I have but there is a dimple in the top near the follower and the follower is steel. Very sturdy. The rounds ride much higher in the magazine and feed at a better angle. Round count engraved on the side is a nice touch. I DID NOT take these apart, I expected them to be serviceable out of the package and there were no surprises there. I loaded the mags and let them set overnight. No cycling, just let them set. Next evening at the range I shot about 100 rounds from each of them with a combination of FMJ, RN and JHP. No malfunctions, clean easy feeding, fast reloads. I loaded and reloaded the mags by hand, something I do not like to do at the range but was forced to since I only had 2 of these at the time. They loaded easily by hand. The tenth round needed a gentle nudge, but hey theyre new right? I compared these magazines side by side with my tried and true ETMs, I like them! The redesigned top of the tube, the new follower and stronger spring were evident. A home run WC! I agreed to be part of a test group to see how this next generation 9mm ETM magazine operated. First, the magazine is extremely well built. It was very easy to load. I really like the hew follower design, especially since it is now metal and they added a dimple. I used it with both of my 9mm 1911s. I fired 200 rounds through my Wilson CQB Elite and another 100 rounds through a NightHawk Custom ShadowHawk Commander. I had no problems and it fed both round nose and JHP. I even tried to push the nose down on the top rounds but it still worked. Again, I am very impressed with this new mag and will be purchasing more in the future. Now, they need to do the same thing with the 38 super. I just used 7 of these new ETM magazines for the initial break-in of my WC Tactical Carry,420 rounds, and had zero issues of any kind. I have found these to be as reliable as all my other WC 45 and 38s mags. Very pleased and proud to own WC products and this is no exception! Thank you for all the development that went into this project. New Style ETM 9mm Mags are Excellent! My wife and I went to the range today with my fullsize stainless CQB 9mm. The only mag we used was the new ETM 9mm mag. Today, we each put 100 rounds of Remington UMC 115 gr rounds through the gun so 200 rounds total. Here are our initial thoughts: 1. My wife was the first to shoot. She loaded up the magazine, and the first comment she made was, This magazine seems to be easier to load than others. Its not bad, especially being a new magazine. I found this magazine loaded with ease also. 2. I wanted my wife to join me at the range, so she could give her thoughts on it. Also, she doesnt have as much strength in her arms and hands, and has a different shooting style than me. So I figured having both of us shoot while using this magazine would give a better idea of how it works with a wider range of shooters. We simply couldnt make this magazine malfunction. I noticed once when she loaded it, the top round was not pointed upward. I was going to mention it to her, but decided to let it go to see what would happen. It chambered just fine. When I loaded it up next, I purposely positioned the top round in the most downward position I could, in an attempt to see if that would cause the round to nosedive on the feed ramp. It chambered perfectly. I laughed and told my wife that I think the only way we could make that magazine malfunction was if we loaded the round backwards. 3. I noticed how easily this magazine slid into the gun and locked in place. It didnt require that extra bit of effort at the end or that little tap to get it to seat. My wife didnt comment on that aspect, but I did notice her not having to slap it on the bottom to get it to seat like she does other magazines. 4. At a quick glance, the new magazine looks much like the old style. Looking more closely, there are a few differences. The new follower design is nice. I like it being metal. I feel it makes the magazine more robust. I am unsure if the other small changes are because of the new follower design, or if Wilson has other reasons. 5. One of my favorite things about the exterior of the magazine is actually something petty. I love that it actually says 9mm on it actually 9mm Luger. I hate having to figure out if one of my mags is for 9mm or .38 Super. This additional bit of engraving on the new magazine takes the guesswork out of it. Overall, I am very happy with this new ETM design. This magazine will always accompany me when Im shooting a fullsize 9mm. The other magazines I have will only come along so I can have more than one magazine with me. I plan to order more of the new ETMs. I would also like to pick up some compact models for my wifes CQB Compact 9mm once they become available. I hope to see a .38 Super version in the future as well. Would be nice if they are offered in fullsize and compact too. Just purchased 3 of the 10 round ETM,s from a local gun store after having issues for my new Rock Island FS-Tactical factory mags. These were 9 rounders that came with the gun and will only cycle with 8 rounds. Bought the Wilsons and as just like all my 45 Wilson mags they run smooth as glass with all 10 rounds loaded. Couldnt be happier with them. I have not been to the range yet. So, they may work great. Out of the box, they look great. I ordered five of these. 2 of them will not free fall eject from my gun. They are slightly wider than the other 3 in the top of the mag. One of the five has a problem after the first few rounds are loaded. The followers skirt gets stuck in the mag catch slot. I removed the follower and lightly sanded the lower edge of the follower with some 400 grit sandpaper. The problem seemed to be resolved. I am hoping for good results at the range.